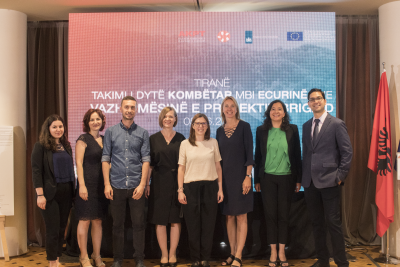 On World Environment Day 2018 the National Territorial Planning Agency of Albania held an event where government officials, NGOs, universities and research institutes as well as members of the general public gathered to discuss the progress of the BRIGAID H2020 project and its prospects in the Balkan country. Gerardo Anzaldúa, Fellow at Ecologic Institute, presented the first results of his working group on business development and financing support to climate innovators. The presentation slides are available for download. The meeting opened with a series of addresses, starting with Mrs. Adelina Greca, Director of the National Territorial Planning Agency, who welcomed the participants and gave an overview of the efforts that the agency is undertaking to raise awareness and roll out adequate plans to address the environmental hazards posed by climate change. She was followed by Mrs. Dewi van de Weerd, Ambassador of the Kingdom of the Netherlands, who reaffirmed the ongoing will to promote the exchange and collaboration between the two countries towards the generation of new and innovative solutions to their common climatic challenges. 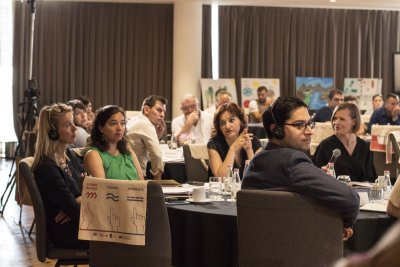 Lastly, Mrs. Gerta Lubonja, Director of the Water Resources Management Agency in Albania introduced the work done by the recently formed institution to ensure the effective governance of water resources in the face of changing conditions. 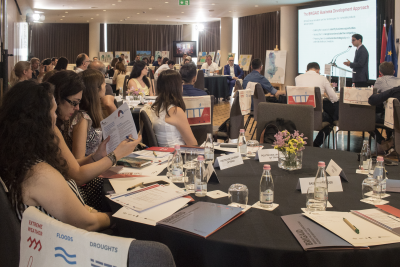 The second part of the meeting focused on showcasing the BRIGAID project and outlining its elements of highest relevance in the Albanian context. Mrs. Marjan Kreijns, Director of the Project Management Department at TU Delft, provided a general overview of the project and highlighted its first tangible results. These included the BRIGAID Climate Innovation Window, an online space where all innovations associated to BRIGAID are exhibited, and the Testing and Implementation Framework, a self-assessment tool to evaluate the technical, environmental, sectoral and societal performance of new innovations. Mrs. Nensi Lalaj, BRIGAID Project Manager in Albania, then presented the project’s vision and challenges as seen from the Albanian angle. She highlighted the opportunities that the project can offer to local innovators and encouraged the audience to engage in the forthcoming project activities taking place within and beyond the country. 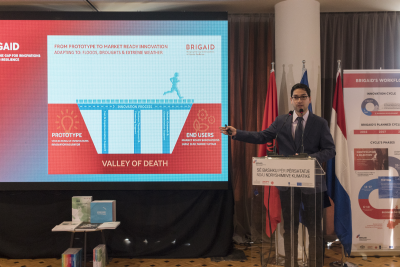 In his presentation, Mr. Gerardo Anzaldua, leader of the Business Development and Financing work package of BRIGAID, talked about the support structures that BRIGAID has established to promote user-centric and globally competitive innovation in Europe. These include the BRIGAID Business Development Approach and the Market Analysis Framework, two collaboration tools which build the capacity of innovators as these prepare for market entry. The last part of the meeting was an open discussion session where participants and presenters engaged in dialogue. A range of topics were discussed, from the impact that decisions made by the authorities, society and large businesses have in the frequency and scale of climate disasters, to the possible ways to raise awareness and promote active involvement from different stakeholders to drive social, economic and environmental advances in the country. The main message that emerged was that while common challenges do exist in the country, through the work of open institutions, and leveraged by its young professionals and its increasing collaboration with the EU, Albania is facing multiple opportunities to increase its climate resilience while contributing new perspectives and experiences to the global discussion on climate adaptation.